Commercial Lease Agreement is used when leasing a commercial property. 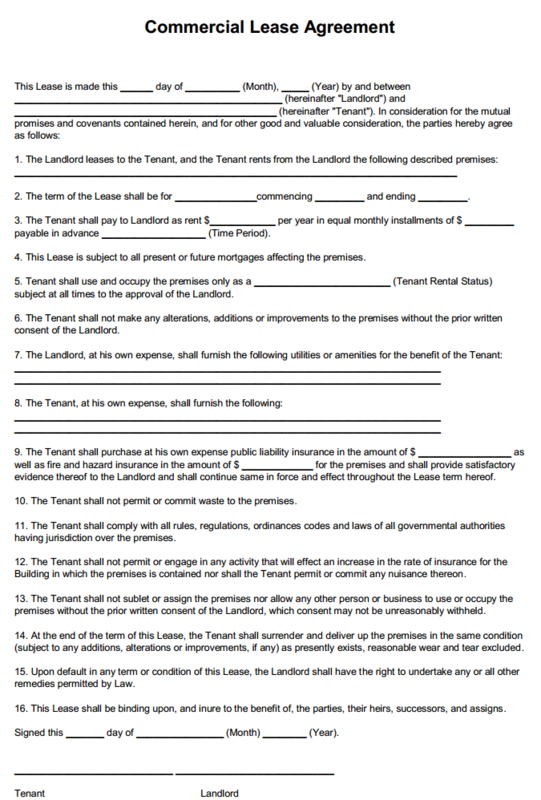 This is Generic Commercial Lease Agreement Template is useful to set the terms and conditions for the renting of a property between the Tenant and Landlord. Since this is a generic Commercial Lease Agreement it can be used in any state, unless the state has a specific commercial lease agreement requirement. The date, month and year of the Lease Agreement, and the names of the Landlord, and Tenant. Address of the Premises that is to be leased. The term of the lease and the date of Commencement and Termination. The rent that the Tenant will pay to the Landlord in both Per Year and Per Month basis. The Rental Status of the Tenant approved by the Landlord. The list of Utilities or amenities that the Landlord will furnish for the benefit of the Tenant. The list of Utilities or amenities that the Tenant agrees to furnish at his own expense. The amount of insurance and fire hazard insurance that the Tenant agrees to purchase at his own expense. That the Tenant will not make any changes to the premises without written consent from the Landlord. The Tenant will not permit or commit waste to the premises. The Tenant will follow all the rules and regulations, ordinances and laws of all government authorities that have jurisdiction over the leased Premises. The Tenant will not do any activity that will increase the rate of insurance for the building nor will he make any nuisance in the premises. The Tenant will not sublet or assign the premises to any other person or business without the prior written consent of the Landlord. The Tenant will deliver the premises in the same conditions as which he moved in at the end of the term of this Commercial Lease Agreement. If the Tenant defaults on any of the clauses stated, the Landlord has the right to undertake any action as permitted by law. The Agreement is to be signed by both the Tenant and the Landlord for it to be legal.